- Widely used in aerospace, shipbuilding, railway, automobile, electrical, chemical and other industries. - Applicable to the body welding for a tank or a barrel, and other metal workpieces. - Applicable to weld carbon steel plate, stainless steel plate, galvanized plate, aluminum alloyplate and other materials as required. Adopting German technology. Components include Mitsubishi PLC, SMC pneumatic components, OMRON induction switch, to ensure the stability of the whole machine. AC servo motor drive ensures accurate and stable operation. Conductive shaft using silver conductive tile rotary device which results in good conductivity. Pressurization systems are uniformly regulated to transfer pressure. The related components are made in Taiwan or Japan. This machine adopts inner cooling system, which not only makes the work environment clean and tidy, but also effectively ensures the safety of working machine. Welding wheels are made from high quility Copper Alloy from our company which are durable in use and have excellent conductivity. 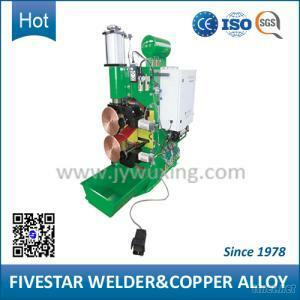 At the same time the machine is equipped with welding wheel adjusting system, which helps surface of welding wheel to be smooth.